This month I join in the sketch challenge by Blue Fern Studios. I love their products!! Thanks to Jelissa Mei, I managed to buy their products! So so excited to use them!! I love their papers and chipboards!! Simply lovely and intricate. I flip the sketch and here's my layout that I made for my girl. I distressed all the paper edges and ink them with distress inks. 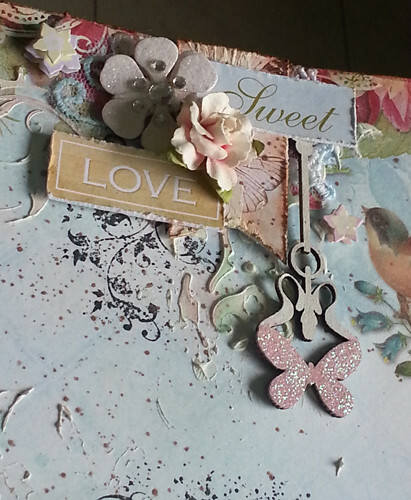 Stamped on background and added texture paste over stencils. Rub some Pan Pastel chalks unto the dried texture paste patterns, misted the background with Prima Color Bloom spray. I inked the Blue Fern chipboards with Mix'd Media Inx and added glitter to the butterflies part. Lace is also added to some parts along with some stickers. Love the smile of my girl. I hope she would pursue her dreams and follow her bliss. Love her much! 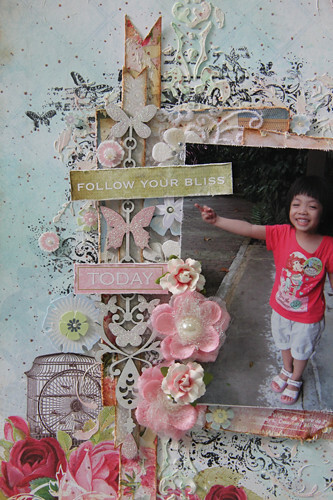 Using cutouts from Blue Fern papers I formed the title "Sweet Love Follow Your Bliss Today". And here's the side view of the main cluster. 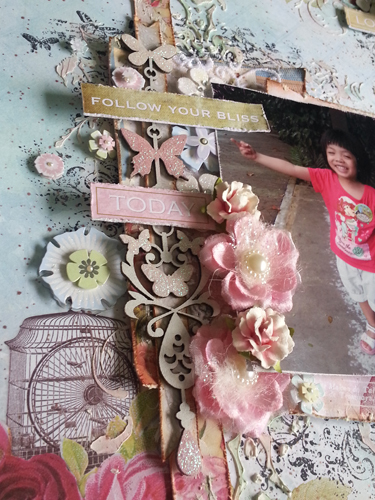 I simply layer with papers, flower stickers, lace, chipboard and Prima flowers. I hope you enjoy today's project. This is so beautiful.. 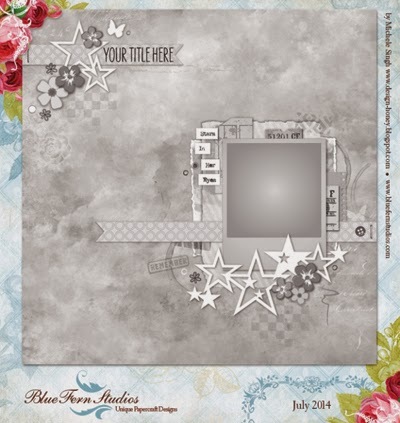 I love your stamping on the back ground and cute photo too! 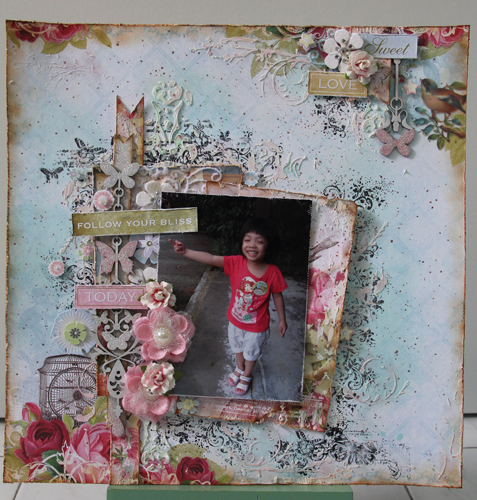 Beautiful LO - I love the texture and the wonderful layers. Love how you flipped the sketch along with all of your layering and embellishments. Truly a beautiful page! Thanks for joining us in the Blue Fern Studios July Sketch Challenge!